The Pan of Hamgee isn't paranoid. There must be some people in K'Barth who aren't out to get him. Unfortunately, right now, he's not sure where they are. His family are dead, his existence is treason and he does the only thing he can to survive – getaway driving. As if being on the run isn't bad enough, he finds a magic thimble. He decides to keep it, which can only mean trouble. Sure enough, it does. He unwittingly sets himself on a collision course with Lord Vernon, K'Barth's despot ruler. The Pan is forced to make choices and stand up for his beliefs. It's a challenge, since previously he had no beliefs he was aware of. Faced with a stark moral dilemma, he realises his new found integrity may even stick ... if he can stop running. Written in British English with some light swearing: Suggested cinema rating, PG: first novel in a complete humorous science fiction fantasy series of four books. 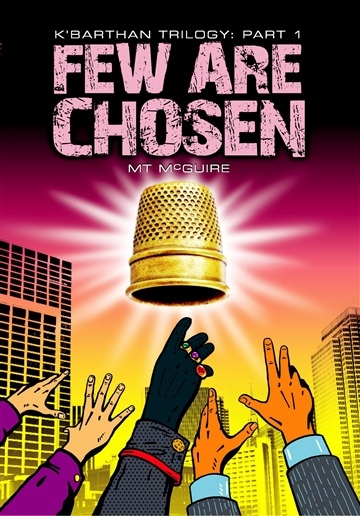 Few Are Chosen is a young adult bestseller book: top 20 and top 100 fantasy in several Amazon categories. Awarded IndiePENdents seal of approval. This novel has a cliff hanger ending, but rest assured the series is complete, all 4 books are available and the plot is resolved at the end of the last one. Normally, you can get the second novel free by signing up for my mailing list but since you're doing that already, I will e-mail you a link to download the second book when your e-mail address comes through to me. M T McGuire is a forty something year old stay-at-home mum. She used to do stand up but sat down to write books when she got married. Sixteen years later, she has finished the K'Barthan Trilogy. She still checks all unfamiliar wardrobes for a gateway to Narnia, which probably tells you everything you need to know about her. She lives in Bury St Edmunds with a McOther a McSon and a McCat. Her blog is at http://www.hamgee.co.uk and she's MTMcGuireauthor on twitter.